I am running Toshiba Satellite Windows 7 laptop. Was using Bitdefender Antivirus (free version) but have switched over and installed to Panda Antivirus (free version). 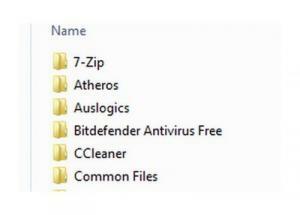 I thought I successfully uninstalled the Bitdefender program but I cannot delete the Bitdefender folder. Have tried a few different delete programs like "Filexile" but nothing works. Does anyone have any ideas that might work? First thing I would do is to boot into safe mode and see if You could delete some of your files in safe mode. It sounds like you might have a partial uninstall of bitdefender, if so then I will usually use the Take Ownership registry hack, you would have to find the Bitdefender folder and right click on it and chose the Take Ownership from the context menu. If it deletes then I would use CCleaner to cleanup the registry. You know you can still run Microsoft Security Essentials until W7 becomes unsupported in 2019. It has served me well over the years, and it is free also. https://geekuninstaller.com/download I also use this little tool to uninstall difficult programs, the force uninstall is really helpful. This tool may not work if you have a partial uninstall of Bitdefender.